Civilisations launched on BBC Two as the ‘Beast from the East’ brought freezing temperatures. Also available as a box set binge on iPlayer, the first programme transported viewers from the snow and ice to ancient locations around the world to capture the foundations of human creativity from the first marks on cave walls made forty thousand years ago. The aim of the series is to inspire a new generation to discover masterpieces of great beauty and ingenuity at the heart of our identity as human beings. The Civilisations Festival is a collaboration between the BBC and museums, galleries, libraries and archives, shining a light on British collections, sparking conversations and sharing ideas about what the term ‘civilisation’ means. Over 300 organisations are taking part as Festival Partners - with more than 250 events, debates and lectures, performances and workshops around the country; many were focused around 2 to 11 March with local BBC coverage. Some have been rescheduled because of the weather. The events have been listed by area on the Museum Crush website through our partnership with Culture 24. Forty five libraries have signed up with some 56 events listed on Museum Crush. Civilisations has also been the theme of the March #LovetoRead book clubs. SCL, SLIC in Scotland and the British Library Living Knowledge Network spread the word. The response from libraries around the country has been fantastic, showcasing the unique cultural contribution they make. From classical Indian dance to calligraphy, the Peterloo Massacre, phantom architecture and bad language, libraries can highlight big themes but always with local perspectives or hands on activities. Middlesbrough Central Library has a 17th century Koran in their Archives as a centre piece for an exhibition highlighting the contribution of the local Muslim community to the development of the town. 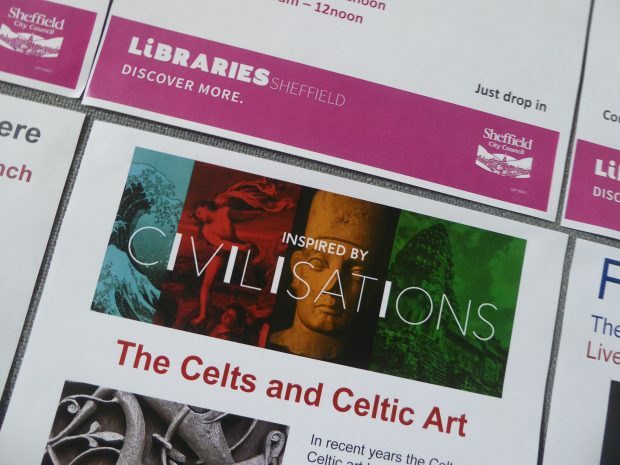 There are still events planned like talks in Sheffield Central Library on the Viking period, Celtic art, and Art and Power in the British Indian Empire. BBC R&D has offered partners access to its digital technology to tell the stories of their collections. Check out the augmented reality app developed with Nexus Studios where objects from partner museums are explored in real world settings - like your living room. Digital stories will continue to be rolled out as the series is broadcast and can be found on the BBC R&D Taster platform at https://www.bbc.co.uk/taster/pilots/civilisations-ar. At the end of April, eleven documentaries, one for each region of England, will be shown on BBC One exploring what art says about the communities in which we live. Amongst the films will be the story of Roman culture in the North East. In the East, Bronze Age treasures feature in an exploration of early art and innovation. And in London, the programme will look at the cultural legacy of Huguenot refugees, from silk weavers to goldsmiths. In Civilisations on your Doorstep (BBC Two), Mary Beard will go in search of extraordinary works of art, from all over the world that can be seen in Britain. She tells the story of collecting around the country, from its royal and aristocratic beginnings, through the acquiring of world collections under the empire, to today’s public debate around what these collections represent.